Fall is finally here and with the changing of the leaves comes a change in our everyday style. So what better way to get fall ready then finding the right makeup. With so many options out there how do you know which brand is right for you? This month Hispanic Lifestyle partnered with HARD CANDY makeup to help our readers get that flawless makeup for this fall season. HARD CANDY is an everyday brand that can take you from one season to the next without feeling the pinch in your pocket book. 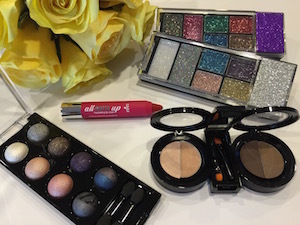 HARD CANDY’S SHADOW SPHERES BAKED EYE SHADOW PALETTES are my favorite. They come in a variety of colors which help brighten the complexion and create a radiant glow to any look. HARD CANDY also carries GLITTERATZI GLITTER GEL PALETTES that will give your Holiday makeup that extra sparkle it needs. TIP #1 You must get yourself in the habit of using 2 different foundations. One for winter months and one for summer. During the winter months your skin is going to go through changes as the weeks pile and the weather gets drier. So having a neutral base will help you adjust with bronzers and blushers to bring color into the face with full control of how much or how little. In the summer time it is all about enhancing the natural glow that is already happening from within. If you don’t tan…. two very different seasons, two very different formulas needed. TIP #2 Bring out your deeper tones… berries, terra cotta, purples, reds, browns, greens. TIP #3 Your moisturizer adjustment from summer to Fall/Winter is just as critical as any preparation for makeup changes. Question – Time is always an issue. What are some quick morning makeup tips I can do that would make the most difference? Lips stain – Lip stain is the “effortless way to get some color back in your face for a healthy glow without a full o makeup routine. Refresh, Recharged and polished on seconds. Question – What is the one beauty product I should never leave home without? Concealer and blush. In a bind concealers can take care of unwanted shadows and spots and a blush can bring some color and “health” and even swiping a bit of your blush color over the eyes ties a very clean look together. Note: If you need to chose one go with concealer. With over a decade of experience in the beauty industry, Tomy Rivero has an illustrious career as a celebrity beauty expert. Based in New York and Los Angeles, Rivero is known for defining and redefining life’s most delicate canvas while enhancing the natural beauty of his clients. Barbara Corcoran from ABC’s hit show, Shark Tank and Peter Dinklage from Game of Thrones. Rivero is also a member of the International Alliance of Theatrical Stage Employees (I.A.T.S.E) Local 798.